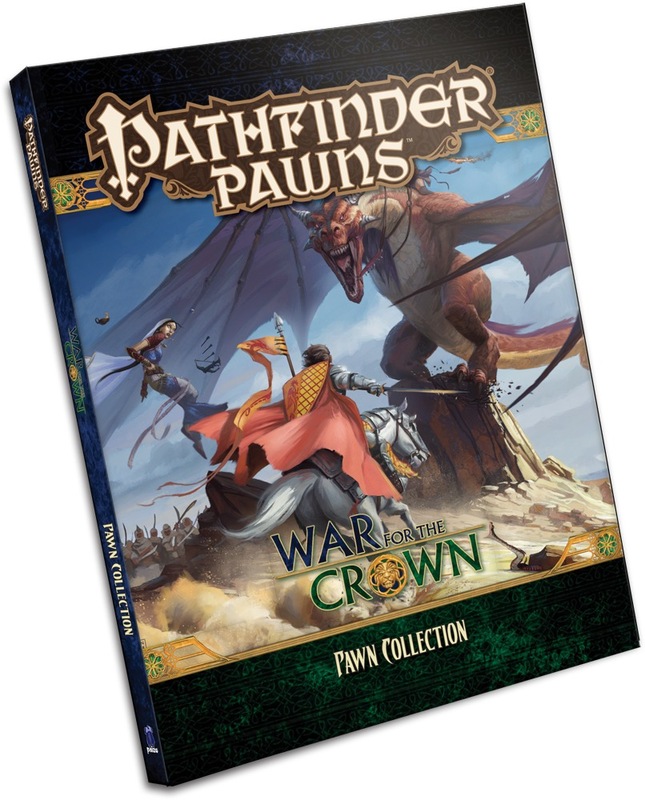 Key monsters and NPCs from the War for the Crown Adventure Path come alive on your tabletop with the War for the Crown Pawn Collection, featuring more than 100 creature pawns for use with the Pathfinder Roleplaying Game or any tabletop fantasy RPG! Printed on sturdy cardstock, each pawn presents a beautiful full-color image of a monster or NPC from the War for the Crown campaign, including scheming nobles, cosmic monsters, exquisite clockworks, and dozens of unique creatures. The pawns each slot into a size-appropriate plastic base from any of the Bestiary Box collections, making the pawns easy to mix with traditional metal or plastic miniatures. The War for the Crown Pawn Collection, together with the creatures and characters from the Pathfinder Pawns: Bestiary Box and Pathfinder Pawns: NPC Codex Box collections, provides pawns for all six adventures of the War for the Crown Adventure Path. Note: This product is part of the Pathfinder Pawns Subscription. One sheet lobotomizes several NPCs and mixes up the names. I had a grotesquely misaligned sheet and paizo graciously replaced it. However the replacement sheet with Lady Lucretzia Marthane, "Lady Martella Lotheed", and Lady Nenareen Adella have all three of them partially lobotomized still, and from further research checking some unboxing videos on youtube, it seems the entire batch has that page shifted up. Also as stated in the previous review, Lady Martella Lotheed has her name swapped with Lieutenant Fanalyx. As the owner of every single pawn collection released so far, I hope Paizo's Q&A steps up their game a bit. Same excellent print quality as all the pawn collections. I was a little surprised that the set came with no bases at all. Also, as noted in the product discussion forum, pawn 76 and 78 have their names transposed. This is especially disappointing because one of these two NPCs (Lady Martella Lotheed) is, in all likelihood, the very first NPC the PCs will encounter in this campaign. Bizarrely, these two shortcomings worked out for me in that the third party bases I purchased so I would have some way to stand these figures up, were cheaper per unit than the Paizo bases, and mostly cover up the names at the bottom anyway. Announced for November! Image and description are provisional and subject to change prior to release. Updated with final product description, set list, and cover image! I believe the PDF has the names switched for pawns #76 and #78.